Reports today of Junot Diaz’s spectacularly offensive behaviour mirror the experience of myself and partner with our harrasser Robert Cripps. The courts, in our instance, supported Cripps’ behaviour determining we had no right to defend ourselves. Why? In part, it was because he used his traumatic war experience as a Vietnam Vet (claims he put in court) to influence how his behaviour would be perceived, the first anyone in the room other than he and his lawyer had heard on the subject. Diaz was raped as child and was a victim. Like our harrasser Diaz has chosen to take this victimhood and use it against others. You’d think they would use their experiences to become more complete humans. Instead they use their experiences to get away with treating others badly. In the case of people like Diaz and Cripps they wear their trauma as an excuse and a shield that deflects any deserving consequences that emerge from their behaviour towards others. So do we accept this is valid? Traumatic experiences give no person the right to harrass, bully, or humiliate another. The galling aspect all victims endure in such cases is to have their rights subsumed, diminished or completely denied in order that the bully with their moronic behviour will feel better about themselves. Victims apparently should not vex such persons in the first place. Galling. Defamation law was used as a tool to victimise and bully us personally for reporting our bully and our experience. Furthermore, it was used to disparage and discredit us, and our art, personally and professionally. Defending the defamation claims of our bully resulted in an outcome that has left us destroyed financially and artistically. We were first attacked by the plaintiff and then by the legal institutions in Australia and finally by a complicit media. In regards the #Metoo #NameYourPig era our situation remains more one of #ButNotYou. We reported via our online art websites our experience of the inexcusable bullying behaviour of a gallery director, of us, of other artists, and of many of his staff and volunteers. His unprofessionalism and inappropriate conduct had been prior knowledge of others in the arts scene, mainly in Melbourne but he had a history elsewhere in the art sector, where he was "castigated" by the industry and was known as a "troublemaker". His repeated aggressive abuse of us, and our art was unacceptable and we had the right to defend our art and selves, ...you would think. Some victims and witnesses had complained online prior our experiences and prior our online complaints. When the same bully sued us those prior complainants went to ground, pulling their complaints from online, or refusing to come forward to speak as a witness to their issue during the trial. Witnesses to his treatment of us refused to come forward - one witness who'd informed an artist friend to avoid the gallery because of what he'd witnessed at our exhibition opening declared complete memory loss of the incident. All feared being sued. They feared what did eventually happen to us, would happen to them too. They were also afraid of exposure to perceived detrimental professional ramifications by association if they came forward. These are the reasons why #Metoo has taken so long to even emerge and is why spinoff inspirations such as #NameYourPig are understandable. Those brave enough to come forward in our case told of a range of inappropriate, unprofessional to despicable behaviours - the plaintiff himself, even his own witnesses demonstrated the validity of the claims we made and that our witnesses confirmed. The weight of evidence, facts, statements, meant our defence was sound and the case un-losable. But, we were later told, "The truth is what the judge says it is." Against the weight of evidence – and in some instance in contradiction to the evidence cited – and witness statements the trial judge found entirely for the plaintiff. Oh, wait, that is not entirely true, the judge did find the plaintiff had improperly withheld money owed to us, awarding our defence around $3:00 AUD to cover the lost interest. The contempt for us, shown by the judge, underpins the problems with defamation law. The institutions of the State, being Australia, punitively awarded massive costs against us. Costs that meant we lost everything we'd materially worked for, as well as our dignity, to our bully. Our victimisation was ruthlessly, systematic made complete by the State, the State's actor, being the judiciary. Defamation law in how it is conducted in this country assists in preventing exposure of bullies and perpetrators. It does so through fear of its power to destroy defendants, preventing the exposure, or prosecution, of already powerful bullies. Defamation law in our case protected the bully who used it to further victimise the victims. Additionally, a complicit media supported this victimisation, actually assisting in its amplification, when it could have done the opposite by looking properly at the case. Media reaction to our case was the antithesis of recent #Metoo exposés. In 2014 the media, reporting on our case, simply regurgitated verbatim distortion of facts and evidence fed them in the trial judge's media release. The judge being outraged more by the atheist art of the defendants, as emphasised by an opportunistic counsel for the plaintiff, aimed to ensure our exposure in the media would be in as poor as possible a light. That it was untrue fabrication and distortion of facts, a further defamation of our moral rights and us, didn't matter to a media hungry for salacious headlines. The reason for our complaints in the first place were due to the attack on us and our art by the plaintiff's repeated accusations the art and we were racist because of the criticism of religions. The plaintiff had couched his shouted accusations at us in claims that were racist towards a culture not even remotely depicted in our art. It was pointed out to him that this kind of racist rant was historically what informed Nazi propaganda. Relaying historical facts to a belligerent bully turned into headlines of the kind that would be laughable if not for the fact they contribute to our ongoing denial of justice and to our loss of dignity, resulting in a petition to Geneva (noted at conclusion). Chief among the complaints by the plaintiff overall at the trial, in his own words under examination by his own counsel, was that his business, an art gallery was severely damaged by what we had exposed; he could no longer procure female volunteers and that he had been unable to attract "a lover". Declaring that he "loved women" and that he was "very flirtatious" the judge ruled we had essentially damaged the plaintiff's flirtatiousness. He lied that he had never caused our exhibition harm, claiming that he always was, and still was "very supportive of the artists" whilst under cross examination contradicting this claim confirming he had a problem with the "whole lot" [exhibition and artists] and had a duty to protect his staff and volunteers from it and apparently from us. We, our matter, had become an embarrassment to the Supreme Court of Victoria, and so, in stark contrast with the trial judge's media attracting release, the mostly reversed on appeal result went entirely unheralded. And, though media were present at both events only one was reported on. All media involved have ignored our efforts to have the appeal result reported. News of most of a trial judge's findings, previously salaciously reported, being reversed on appeal, under any circumstance, you would expect, should cause great interest from the media. However, all prior keen interest shown had vaporised and has mysteriously failed to materialise ever since. The money we were forced under penalty to pay the plaintiff post trial was ordered returned on appeal but without similarly imposed timelines or penalty for failure to do so. It meant we would have to spend another 160k to get it back from the plaintiff via legal action we could not finance. We had exhausted everything on appeal. This was as deliberate as the overturned punitive damages awarded against two artists with few financial means beyond their family home - which was, by the appeal verdict stage, all gone. After losing the appeal the plaintiff declared bankruptcy (hiding all of his assets) meaning, a) we could take no action against him in the conventional courts anyway and, b) we'd have to pay a trustee around 160k to progress their recommendation that 7 matters regarding the bankruptcy warranted further investigation. So, why would a victim come forward to denounce his or her bully publicly? They will be dragged through the courts, made out to be liars, be stripped of all financial assets, caused further damage in the media and even with confirmation of their original claims will be left to swing in the noose the complicit media had helped to string up. The power wielded by a serial bully, misogynist or predator alike is amplified and is emboldened under the protection of such system-supported dysfunction. If a victim is brave (or stupid) enough to test this I refer to the experience described above. Ultimately the mere threat of punitive defamation court action prevents most from speaking out. Indeed it looms as a threat for witnesses who feel exposed to litigation too. Combined with our actual experience this is the "chilling effect" and its realisation through defamation law. Defamation law is not only a threat to victims of bullies it is a threat to an open, just society, to transparency and "free speech" in how it acts to chill speech and by extension stifle an otherwise free (though easily confused) media. It is not a new concern for the media and is regularly pointed out by commentators on its own behalf. Problems exist due to a persistently flawed understanding of defamation law in how it is conducted in Australia. "Defamation turns on truth and falsity. No wrong is committed by telling the truth about a person." In regard to Australian defamation law this is entirely wrong. And, it is why all journalism and comment by anyone not actually practicing or experiencing defamation law in Australia continue to get it wrong. Truth in Australia is irrelevant, as it is not a complete defence. The if you have told the truth you have nothing to fear mantra is completely without basis in the Australian jurisdiction. To defend a defamation in Australia merely demonstrates an admission to having defamed. You, the defendant, must then prove, not the truth of the claim/s you made, but the truth as against the imputations manufactured by a plaintiff. 'Truth' is a relative concept in Australian defamation law. Australian defamation law is plaintiff weighted in the first place and its feature tool, defamation imputation, is solely at the disposal of the plaintiff. A plaintiff's claim, about what is written, is that an imputation, or "innuendo" has been conveyed by what was written or said. The plaintiff decides the meaning and it is then this meaning or innuendo that a defendant is required to defend. This is precisely how informing a ranting, belligerent, obnoxious gallery director that his repeated racist claims belong historically in Nazi era propaganda becomes a screaming headline "Hitler rant costs artists dearly" years down the track. The media perpetuate the problems with defamation law by reporting, without understanding; nonsensically what they are fed one screaming headline after another. It is like a protection racket, infecting not only defamation law but also the balance and functionality of democracy itself because how defamation law is conducted in this country means you cannot reference history in a debate as you risk having a defamation claim made against you! On this basis our case should never have passed the first court hearing. There was never a defamation to answer to but there was a disgruntled litigious plaintiff who did not accept his historically based racism was the problem. Additionally, as if the above was not nearly enough, under Australian defamation law, perversely, truth does not even matter. The appeal court ultimately found though what we'd proven what we claimed to be true we had no right to inform. Truth is not even close to being a defence in Australia truth is irrelevant. Like any protection racket defamation law can be abused from within. A judge on a personal crusade can crush divergence by applying meanings that bear no resemblance to the truth or statements made before him. Our case is cautionary and is illustrative as to why, disturbing as it may be for some to acknowledge, defamation law as it stands permits unacceptable behaviour to go on unchallenged, and indeed to flourish for decades if not for generations. Defamation law is a destructive relic of a different age and it must go entirely as it is unlikely to change enough to fit a modern society's values and expectations. For now, we barely survived the Alice in Wonderland experience, lost down the rabbit hole into a court system where a real life Red Queen screamed "Off with their heads!". It is a land where we, the victims, were dealt with as perpetrators, punished, shamed and defamed for daring to out our bully, our "pig". Still shattered we've found nothing has changed for the better, not least because nobody knew, or cared less, because it didn't happen to them. Potentially an era post #Metoo, post #NameYourPig may see change for the better. A petition has since been lodged with Geneva under the ICCPR. 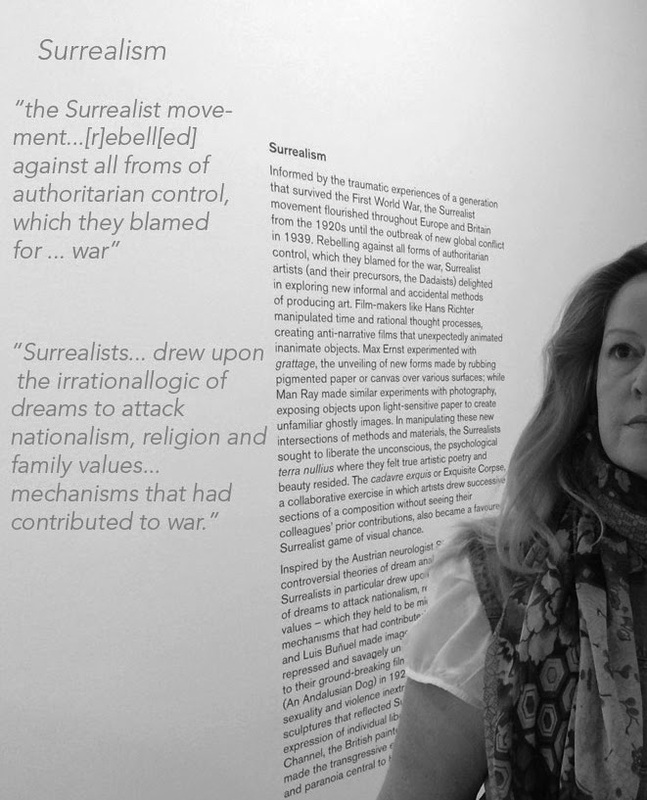 Surrealism as an art movement is at its foundation transgressive, cynical, satirical and critical. All the adjectives within the title of this posting can and do apply to a variety of surreal art. The early Surrealists pointed out the hollow men, ideas and doctrines of its time, using visual symbol and word. Attacks by the surrealists mocked a complacent, accepting bourgeois society directly, or through the political and religious structures that motivated and lead it. Surrealism was and remains fiercely intellectually driven, anti-Fascist, anti-nationalist, anti-theistic. There were an array of reasons for how or why this intellectual rejection of conventional structures developed, social and geo-political, dating to well prior the 1st and 2nd world wars, that I will not go into here. Here I merely wish to demonstrate how Surrealism did, and still does, encapsulate all the aims and characteristics of what Art is understood to stand for in intellectual terms, and why this practice is under threat. In 2015 the Supreme Court of Appeal in Victoria heard an appeal for a 2014 judgement by Justice Kyrou, who had found against myself and fellow artist Demetrios Vakras. The following question was posed by one of the appeal court's judges, Justice Digby: "Did Mr Cripps (the Gallery Director) know the [art] exhibition (by Vakras and Raymond) would be contentious?" Apart from the sheer irrelevance of such a question to determine any of the facts in the case, it demonstrated the very stark chasm of understanding existing between the reality of what are intellectual pursuits, like art, and the law as represented by its practitioners. Arguably, one might consider our judges sit at the higher end of our society's intellectual bell curve, yet the reality is this is as false an assumption as the one made in any belief in the existence of an inherent fairness in law. Secular societies, like our own, generally equate fairness with logic and reason. These are intellectual concepts and they are valid but they do not feature as complementary characteristics within our legal system. 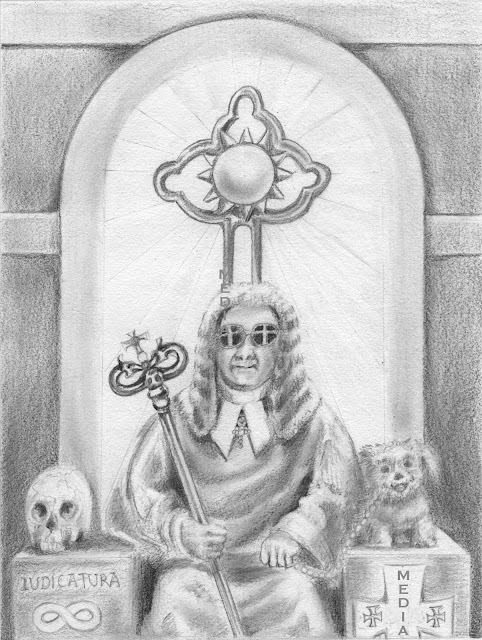 The rule of law concept is governed by other motivations and ignores pagan concepts such as logic and reason. Fairness does not figure where precedent and case law, as a codex and charter, operate. As one gets too close to see through the veil to the real system under which our courts operate, one sees how more and more it closely aligns with religious imperatives of control, rather than for agreed to contracts around social protection and regulation. Suffice to say here there is an inherent absence of what are traditionally held and understood concepts of logic and reason within our legal system. Our legal system relies upon the setting of precedent and rule of law and its application under case law conventions in order to work. This though relies upon all players in the court behaving as they should. If Vakras' and my case is to be shown on appeal to have been mis-judged, then perhaps some will claim that this demonstrates the court's methodology does make the correct call. However, under so basic an analysis, we instead have a logical fallacy, as such a conclusion would ignore what it took for that appeal and correction to have been made. It is the case the appeal only went ahead because we lost everything we've worked for across our adult lives in order to fund the appeal and compel the law to do the right thing. We were forced to ensure that the appeal would proceed otherwise, regardless of errors in law, errors in judgment, and the magnitude of these errors it would not have gone ahead. Others coming after us as a consequence of the judgement against us, whether this is understood or not, currently have had to deal with a minefield of legal outcomes with ramifications that spread into limiting our human rights. It needs to be stated loudly and defiantly over and over that a fair and healthy legal system does not limit rights, nor limit access, nor limit truth, in order to instead enable the meting of a kind of justice that achieves only individual aims, aims bearing no relationship to lofty claims of protecting a citizen's universality in the eyes of the law. Vakras' and my experience situates such lofty claims into the realms of sheer fantasy. Judicial impartiality is critical to the fair and equal application of so stringent a doctrine as case law and rule of law. A judiciary must be as selfless and as blind to external biases as the symbols of the court claims they shall be and are. The reality is, as we have come to know to our complete detriment, that the facts become what the judiciary decides them to be, regardless of evidence, making the law as flawed as the ability for its judiciary to resist what individually held subjective sensitivities and confirmation biases they each may possess. So, when a judge of one of the highest courts in Victoria, Australia asks; Would an art gallery director have been aware that art might be contentious?, and no one except the unfortunate artists, responsible for said "contentious art", understand the absurdity of such a question, you have as Kafkaesque a situation as any that can be imagined in fiction. Such a question might justifiably be posed by one completely unfamiliar in anyway with art, art concepts and art practice. It cannot though justifiably be asked by one with limited or no understanding of Surrealism alone. Because, though a judge may not be aware of surrealism, art and artistic pursuits are understood to have elements to varying degrees of and potential for contentiousness. Art, it is accepted and known, will push boundaries, so our supreme court should be just as aware as my high school educated hairdresser is that one does not go into an art gallery expecting to not be presented with a challenge. One goes into an art gallery expecting challenges, expecting to disagree as well as agree, expecting to potentially have their thinking changed or charged by exposure to a different perspective. Such a question, as it was asked in a court of law regarding a judgement under appeal seeking to ascertain if that element of the appeal is valid, might well presuppose that art that is "contentious" is the either invalid, or unlawful, or both, or that it is to be held as less likely to be justifiably art at all. Perversely and in addition art that is "contentious" has for now been found by the Supreme court of Victoria to be possibly "racist", due to a use of "foreign" words. In the 2014 trial the claim was made, and the judgement upheld that claim, that because words written in a script other than the English "alphabet" (sic) to describe the meaning behind the visual works, it was possible to detect "racism". In this trial the statement was made that the text needed to be corrected into English, or made more vague, or taken away all together so as to remove the potential for offence made by the "contentious" and/or probably "racist" art. This was all said to have happened, but, it was asserted, to have been done without any claim that the art was "racist", it was just that the director thought it might be "racist" because he did not understand the writings at all, and anyway there were "foreign" words used. Those "foreign" words were Greek, 4 in all, and all were provided with their english word equivalents in translation. 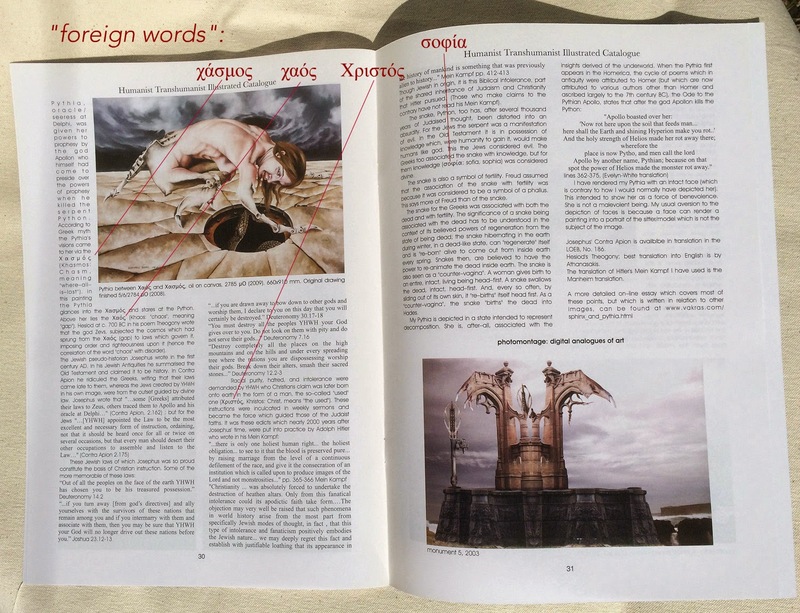 Other "foreign" Greek words included the signature of the artist to his works, a practice of his since the late 1980's. How it could be possible to conclude that the use of Greek at all, or the use of Greek words translated into their Latin text equivalents might be possible to be perceived to be "racist", is now the subject of a Federal court claim. What were these sinister words? Chaos, Chasm, Christ and Wisdom. The problem apparently arose because these words being written in their Greek equivalents, transformed them into holding another meaning altogether, making them very scary words indeed. Surrealism's use of symbols, the fantastic, and the grotesque, as applied in satire or as biting juxtaposition, was not something new but something it embraced within it visual arts sphere enthusiastically and adeptly. In our 2009 exhibition "Humanist Transhumanist" we did little differently and adhered enthusiastically to these traditions in our presentation complete with visuals, text panels and self-published manifesto. The fantastic and grotesque in application has long been employed by artists and as recently as the Gothic Romanticists in immediate historical context with and as precursors for the Surrealists. The Surrealists mined the Gothic repertoire not only for thematic value but in seeking to transform medium and technique. Blake's use of imagery and text, the technical transition into a use of print making, etching and aquatint translated into Ernst's collages and ManRay's photographic experimentation. From Goya's seditiously biting War series, to Fuseli's nightmarish visions of a human psyche undermined by an inner torment, the exploitation of symbolic meaning sat behind an application of fantastical imagery to great provocative effect. As a two centuries earlier Dürer might have thought, it is sometimes necessary to distort, juxtapose and disfigure, to disjoint and cause alarm in order to effect understanding and comprehension of an alternative idea and way of thinking. (Try telling this to a judge in present day Australia.) In the case of Goya and Fuseli each utilised religion, superstition and pagan themes to bind their visions. Fuseli and his contemporaries were critiqued for their "bombast & extravagance", though not in a law court. 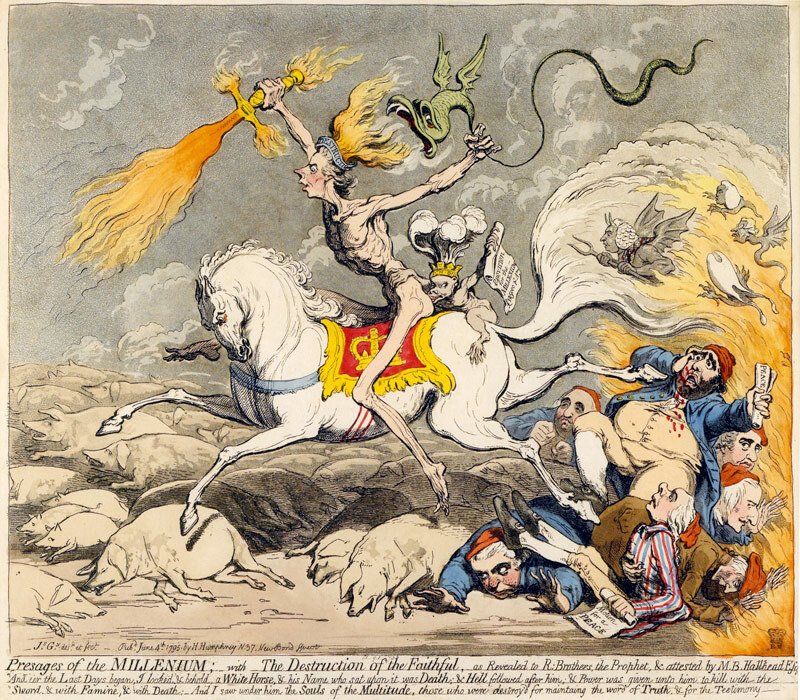 Satirical caricaturist Gillray, a contemporary and beneficiary of Fuseli's themes, applied an openly raw and grotesque symbology of imagery and words to hit home his message of seedy sedition, collaboration and/or political hypocrisy. The Surrealists were shaped by these influences during similar times of upheaval, deploying a new and unrecognisable symbolism with which to turn accepted thinking and taste on its head. Surrealism was classified Degenerate along with other modern art forms by The Nazis and Hitler. The Nazis' required art (contradictorily it would seem but never argue with a Nazi) to need no explanation in order that it be better understood by the ordinary German/people. The contradiction was that explaining the art made it more degenerate than ever of course because, before explanation you might only have the suspicion it will be contentious because you can't understand it. In 1937 the Nazis instructed that art must be simpler, in 2009 Vakras was told as much by Robert Cripps who again confirmed in court in 2014 that the art was not simple enough to be understood and so it was possible for him to then assume it held a more nefarious meaning. For this reason the viewer of the art needed to be protected from potential harm with the positioning of disclaimers. In the judgement by Justice Kyrou following that trial Surrealism and at least the Surrealism of in particular Demetrios Vakras and also of Lee-Anne Raymond was rendered Entartete Kunst (Degenerate Art) as that judgement concluded it was possible to conclude the art might potentially be "anti-Palestinian" or "pro-Israeli" and therefore too contentious. Neither Cripps or Justice Kyrou managed to explain either how or why this could be so. It was simply accepted in judgement that if the art could not be understood, it might be considered "anti-Palestinian", because "Palestinians are oppressed" by Jews. In the expression of ideas deemed seditious, anti religious or anti-social it would seem that art can become degenerate anywhere, including in Australia. The surprise is this occurred in a modern democracy, in Australia in the 21st century, and it would seem for now, to little or no protest of any kind from an obviously comfortable, complacent and compliant Australian art scene. Art, of the politically, socially and religiously powerful expresses the ideas of these foundations in only uncritical, consistent with conventions of taste, and compliantly supplicating ways. Such art celebrates the status quo not only in taste but in thinking, in attitude, and in effect society will stagnate where a thriving art scene of this kind is supported and endorsed. Protection of socially approved-of art forms, that have no idea to challenge or theme to propound, so as to prevent hurtful offence being caused to anyone, does us the worst kind of social harm. History has shown this over and over. Such art, the art of sycophancy, reflects the kind of society it exist within, and such art in time with the benefit of hindsight becomes categorised as propaganda at worst, decorative at best. The freedom to criticise ideas is under threat in Australia, the effect of which is being seen in the arts. Like the metaphoric canary in the coal mine we as artists are signalling to you all it is time to come up for fresh air. Take a clear deep breath and think. Subjects are now off limits that formerly had no such barrier to being debated. Criticism of social systems, political figures, religions, cultural practices are all off limits for fear of causing offence as the result is very real and punitively punishing consequences. It is as though being offended because someone has critiqued your idea is a new kind of assault crime to charge a critic with. Do not criticise my ideas because as I identify with them by critiquing them you will have critiqued, humiliated and offended me, and for that I will sue you and the court will agree with me. This is the legacy of our Supreme Court of Victoria case, the case against artists Vakras and Raymond. Next time you feel affronted or challenged in a gallery steel the personal ire you may experience enough to ask the following question of yourself. Should I upon entering an art gallery expect anything less? As an atheist and surrealist artist who has and who will continue to criticise religions I reserve the right to offend, insult, humiliate, ridicule and defame all gods and their associated prophets. But depicting one and critiquing one prophet only, Mohammed, is illegally and illegitimately outlawed not only on the threat of but by the real prospect of execution. The brittle religion of Islam is protected on pain of death by followers of that faith. Those defending the rights of that faith to express itself without criticism fail to understand they are defending the intolerant and a brutal ideology based on intolerance. I make no apology to Islam, Christianity, Judaism or other religions and supernatural belief systems for any hurt. With regards criticism of religions the mainstream media, political climate and social commentary have contributed to the demonising of anyone who critiques Islam because to do so is claimed to be racist and right-wing. Yet conversely Christianity or Judaism are fair game because, they somehow deserve it having caused enough bloodshed, pain and outrage in the past. Err, what? The sheer contradiction, lack of logic, and lack of historical knowledge is breathtaking. Charlie Hebdo were largely shunned and cast as intolerant by this mainstream as, "white privileged male racists" for their critical satire lampooning Islam (only Islam). Charlie Hebdo though ridiculed all religions and politicians or societal structures on a wide scale and has done so with anarchic glee, none were/are/will remain immune. Why did/does their satire of Islam illicit a different examination by apologists, was it, is it fear of offending intolerance? Such acts of provocation, of anti-establishment dissent and resistance have a long history in France and in pre and post industrial western Europe. For free thinkers, and those who enjoy the freedoms afforded within a free society, whether tasteful or not, such criticism including the right to satire and ridicule a subject, are recognised cornerstones of that free society. Charlie Hebdo are a stark and now painful reminder to society that it needs prodding and lambasting for it to wake from its "sleep of reason”. Charlie Hedbo in all of its satire was delivering one message, perceive of what you are forgetting to protect and preserve, your hard won and long treasured freedoms. The ability for any force or will to destabilise and undermine free societies exists and the responsibility to protect what underpins them sits squarely with those who treasure freedom. We are these custodians, us, we are the ones who must protect such a society by exposing its flaws, foibles and fallacies. This is what Charlie Hebdo was getting at with every lampooning of authority. Surrealism was born from such an era emerging from within a society that needed reminding of what it was allowing to slip through its fingers. The freedoms we take for granted today were under attack then by an ideology and a warlord of a different kind. We are living in as similarly an absurd time as now surrealists, satirist, critics of all kinds are again being shunned and marginalised for critiquing that which is oppressive and backward in Islam. Defenders of Islam claim it should not have to defend itself due to random misguided acts of violence by its followers - which forgets that all these followers, follow the same doctrine, the Koran and Hadith. Under such circumstances a response is warranted. By not responding strongly or at all fails to neutralise those elements within Islam who continue to take all of the prophets "teachings" to their literal conclusion. And, their mantra is always the same. In the related violence and hostage taking in Paris following the Charlie Hebdo murders by the Islamic terrorists, the Kouachi brothers, their associate, Islamic terrorist "Coulibaly told BFM he had 'coordinated' his actions with the Kouachi brothers and wanted to defend Palestinians and target Jews" (ABC). So, there we have it. Mocking the prophet, criticising Islam all links back to the conflict in Palestine and an insidious Jew hatred in the mind of the terrorist. It is the most deep seated and chronic of encumbrances affecting the very viability of Islam and the reason for why it is the biggest threat to the stability of a modern society which, as in the France and Europe of the 1930’s, continues to prefer to be blind to and in denial of it. The primary motivation as always are predictably an unbridled racism toward and hatred of Jews. To critique Islam means you support Jews and are anti-Palestine so one must be eliminated to defend the other. Criticism of Islam apparently justifies any backlash by Muslims against that critic. Criticism of Judaism or Christianity elicits no such equivalent assertion or defence. It is the critic of these acts who must instead answer for the criticisms made. It is the critic who is forced to defend their criticism as if their criticism is somehow responsible for inspiring acts of violence done to protect Islam from insult. Islamic Jihadists* blame any insult to their prophet on Jews and claim they are defending Palestinians from Jewish violence who cause conflict by their very existence in Palestine. Jews do not apparently belong in Palestine and need to get out one way or another. With this sentiment those who sue surrealist artists, when informed their ideas about Jews and Palestine are racist and have a historical beginning pre the establishing of Israel, are in alignment. It is a successful tactic in the aim to subvert and deflect blame so that only the critic and the Jews are responsible for the actions of violent religiously motivated murder, such as that enacted by the Kouachi brothers on their unarmed victims. Put simply Islam hates a critic and hates Jews. Passages in the Hadith essentially state the existence of Jews in Arab lands is to be addressed by their elimination from those lands. Jihadists* act murderously on such passages because to do so, as goes their own claims, defends Palestinians and Arab lands invaded by Jews (the so name “occupation”). Islam even hates its own progressives. Islam hates its apostates, a Muslim may not leave Islam to do so is the worst of sins punishable by death. Islam tolerates people of the book, Christians, but then defines them as non-Muslims describing the Christian trinity as a blasphemy. Islam in particular just hates Jews. Modern Islam in contrast with other major religions continually demonstrates its unwillingness to peacefully co-exist. The so called "religion of peace" label is a marketing propaganda well utilised to deflect blame and erect barriers to nullify any scrutiny. The idea that a religion operating without scrutiny is a problem waiting to happen is not so far fetched or without precedent if we look at the conduct of the modern Catholic Church and its other associated institutions recently held to account. Islam as per most religious institutions lack the maturity and intellect to be self regulatory. Yet, there are those who maintain we must absolve Islam from responsibility for addressing acts, that are done in accordance with its doctrine, by the faithful who exact brutal revenge because the doctrine demands it. The problem for modern society is that Islam acts to its exclusion, consistently demonstrating that its tenants are incompatible with modern thought and even basic principles of human rights. In 2015 Islam remains a totalitarian, backward and redundant belief system. Muslims, as Ayan Hirsi Ali stated post the Charlie Hebdo attacks in an ABC 7:30 interview, need to better imagine or hope for "an ideology or ideas of life, love, peace, tolerance”. (She will astoundingly be labelled racist and right wing for doing so.) Should Muslims dare to view such a future of course they ultimately will need to abandon Islam in order to achieve it. Monsters emerge with the “sleep of reason”. 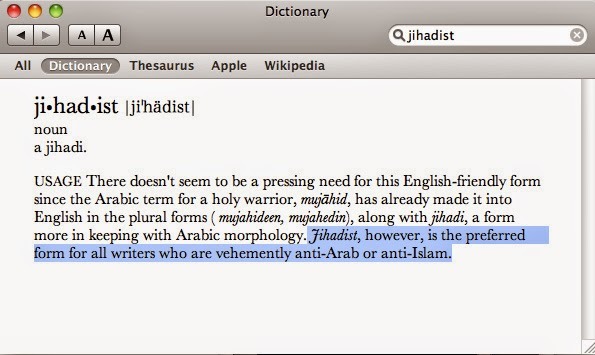 * "jihadist" is a term considered "anti-Arab or anti-Islam" by Apple and its third party dictionary vendor New Oxford American Dictionary. Best inform all the mainstream media outlets including France24, CNN, ABC, BBC etc, etc. Use of Greek script judged “racist”, “sinister”, “anti-Palestinian". Only in Australia. A Supreme Court of Victoria judgement released in June 2014 endorsed the racist claims made by plaintiff Robert Cripps. In the trial it was declared that “text labels, 50x100mm pinned below each painting” included words in an “alternate script” to that of the “English alphabet” (sic), making it possible to reasonably conclude that the text potentially communicated “anti-Palestinian”, “sinister” and “racist” messages. It was argued, by Cripps’ council, Christopher Dibb, that because Cripps was not of Greek background he could not properly interpret or understand what was written on these "text panels". The only conclusion, that was available to Cripps, was for him to deduce that the use of Greek script was potentially “sinister, racist and anti-Palestinian”. Under examination Cripps could not explain how this was so in his testimony. - No labels were pinned under the paintings. This was demonstrated by the evidence provided in trial which included photographs taken prior to the dislcaimers that Cripps posted. Cripps had testified that he posted disclaimers as a reaction to labels which are clearly absent in the photographs. Emails and documents cataloguing the exhibition content reveal that the photographs of the exhibition match what was discussed with the gallery prior to the show. The evidence demonstrated there were small numbers pinned under the paintings to reference against a gallery catalogue of works list for all viewers to consult, just as had been discussed in the emails between the artists and the gallery. The evidence and the facts they conveyed were all dismissed by Justice Kyrou. 2. Validated and up-held racism towards an Australian-born artist of Greek heritage. - In finding it reasonable for Cripps to have concluded what he did and taken the actions he did because of the presence of an alternate script to English (sic), Greek, Justice Kyrou agreed it could be considered to convey sinister, or racist, or anti-Palestinian messages to use Greek words. A finding that is in direct contravention to S. 9. of the Race Discrimination Act. The Australian-born Greek artist, Demetrios Vakras, has for many years signed his paintings in Greek and as part of his artistic oeuvre long sought to elaborate on the ancient scientific and cosmological meaning behind many Greek myths. In doing so he is manifesting his heritage, a protected attribute under the Race Discrimination Act, (S. 9). In Humanist Transhumanist there were a handful of Greek words used in context of two paintings with essays pinned beside the associated paintings on A4 size paper (No 50x100 labels under paintings ever existed). These Greek words were methodically translated into Latin text for an English speaking audience to comprehend. The context of these essays was to elaborate on the meaning of the visuals in which the artist anthropomorphised myth-concepts to reveal a holistic, cosmological explanation exists behind Greek myth pertaining to, for example, the Pythia (the Oracle of Delphi) depicted resting between, χαός (chaos) and χασμός (chasm), in another Χριστός (Christ) is referenced as is σοφία, (wisdom). It is therefore these Greek words that Justice Kyrou found in his judgement to be potentially “sinister", “racist" and "anti-Palestinian” in agreement with the plaintiff. Justice Kyrou, in his judgment, also concluded the art and exhibition to be “offensive”. On much Justice Kyrou and Robert Cripps were in agreement. Justice Kyrou awarded record financial damages against the artist Demetrios Vakras and co-Exhibitor (this author). 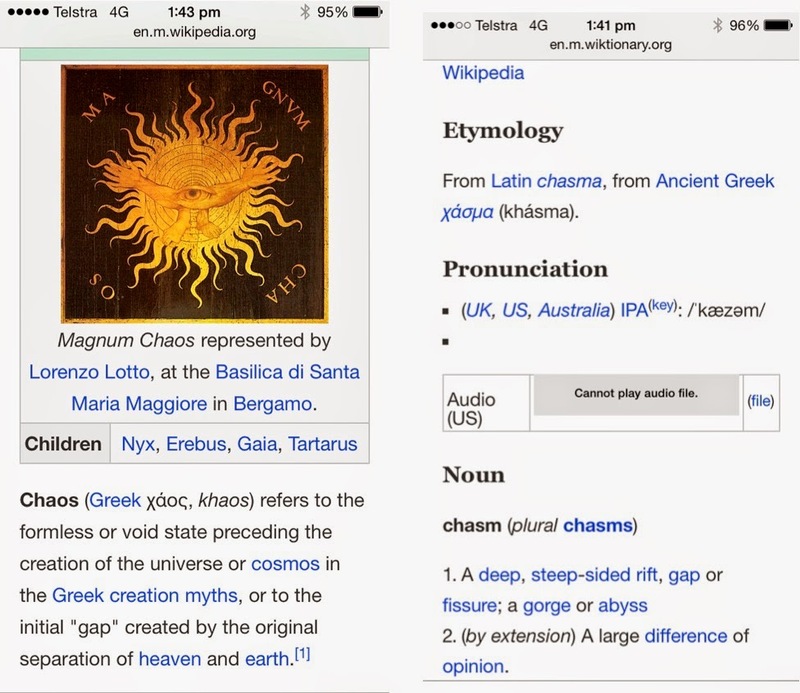 If the absurdity of the claim that the use of Greek text could be considered in any way to convey a sinister message is unclear refer to any Wikipedia entry on χαός (chaos). Is this sinister, anti-Palestinian and racist? 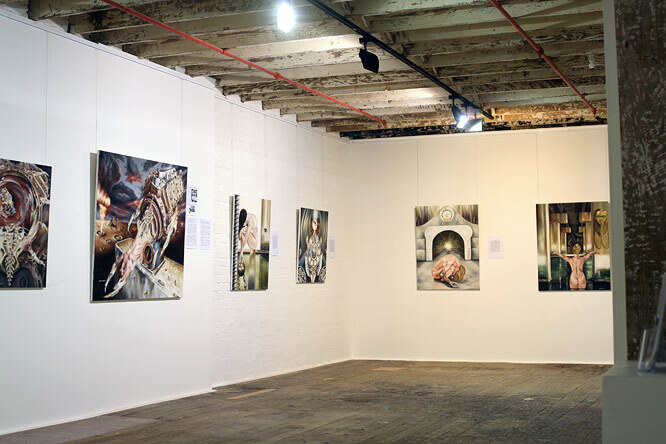 Then compare it to the actual text from the exhibition in question, "Humanist Transhumanist". Is this sinister, anti-Palestinian and racist? Pages 30-31 Humanist Transhumanist Catalogue. The author has used Greek words in this posting. Is this sinister, anti-Palestinian and racist? If one is sinister, anti-Palestinian, racist, then they all are. Or, is it only the case when a Greek does so? It is valid and correct to ask why is this judgement is not considered one of the biggest failures of the Australian Court System? Do the courts have more rights than the people they exist to serve? If this is the Australian justice system working then it is as unjust and backward as any one can imagine produced under totalitarian regimes and Australians who claim to advocate for our human rights or to “keep the bastards honest” are silent. The matter of Cripps discriminatory actions against Demetrios Vakras is being pursued in the Federal Court. Australia is governed by a deeply protective, institutionalised, conservative moral philosophy that is reinforced by a self-interested cultural sector, legal authority and legislature. Rather than acting to resist in the erosion of freedom of expression these authorities and cultural bodies keenly maintain the status-quo preferring the entitlement this brings above overthrow, evolution, revolution and therefore change. 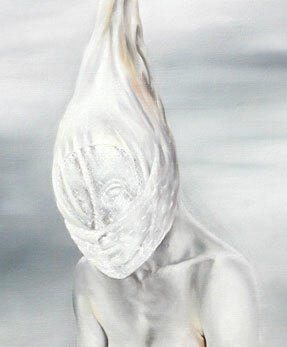 The art of Surrealism has at is core the nature of transgression. As an art-form, as a way of life (as many of the original Surrealists experienced it), the genre observed the world in which they lived through a critical lens reflecting reality and truth to demonstrate what was the real illusion or delusion - the perception of the accepted reality as being all that was good and beneficial. Now in more enlightened times, we see the Surrealists as cause célèbre fighting against evil and oppression, yet they remain marginalised fringe dwellers in our public art institutions. 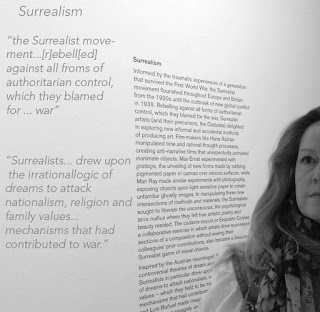 In their time the Surrealists were roundly rejected and marginalised for their unflinching criticisms of authority and of the political and societal institutions in which they lived. They were labelled “offensive”, “immoral” and “negative” and their art “degenerate". They had many enemies but fortunately a few influential allies in addition. In Australia 3/4 of a century later judicial institutions protect themselves by enacting religious like decrees, edicts, to prevent criticism and will and do punish their critics for transgressions, artistic or not. Individuals within or who are outside beneficiaries reinforce their own position and tenure by ensuring no steps are taken to question either their own or the institution's role. No mirror may be held up to liberate the truth, let alone allow for the kind of truthful self-reflection that might allow for illuminating change. In Australia there is a distinct and entrenched perception that to question authority is simply wrong, to challenge it or expose truth “negative”, “intemperate”, "racist", "immoral", “offensive” and perhaps “degenerate". To be critical is to be “aggressive", to be transgressive, “intemperate” and “immoral" and therefore repugnant to society. It has become so very Australian to be squeamish about speaking out against anything, be it an idea, an organisation or a person for fear of causing offence. This is in no small part due to the fact there exist written and unwritten laws to deter and prevent criticism. The unwritten laws will have you socially and professionally shunned. The written laws have the critic fearful of attracting financial repercussion and legalised persecution. Additionally there is an Australian characteristic, perhaps transposed with force by colonial, antique (European), magisterial beginnings, that is now a self-sustaining conservative moral. So, although born from more imperious beginnings (lèse-majesté), keeping silent for fear of experiencing physical harm, has transformed into a distinct Antipodean fear of expressing critical thinking because it can and does attract financial penalty and social ostracism. In my case criticism of how a Director of a now defunct gallery behaved toward us during an exhibition by myself and fellow artist has resulted in record penalty and complete ostracism from commentators in the arts or political communities. Presumably this is because they might agree with what is a truly bizarre judgement in the face of the actual trial evidence, and, or are too fearful of receiving the same treatment, to object or question it. Logic and reason are the enemy of our judiciary if as it transpires the evidence regardless of the facts are what the judge says they are. Australians and the institutions that are intended to operate for their benefit are intolerant of anyone who would seriously challenge such institutionalised authority, effectively shunning those who speak for freedom of expression and thought. Unwittingly (one would hope) by their acquiescent silence Australians who could or might normally speak up are merely reinforcing their own censored existence, and the persecution of those who do attempt to resist it. When we legally constrain our artists and thinkers who might criticise us, deter criticism through the actual application, or threat, of law and punishing legal fines we are assisting in the creation of our own end of times. When we enact laws to limit critical analysis and thought of a subject, an idea, an uncomfortable history, an authority, a religion in order to protect these concepts from harm (defamation) we are limiting our own freedom of thought and expression. In a liberal, secular democracy, where dogma (religious, political, cultural) and its protection above all is allowed over a flexible application of logic and reason it is the beginning of the end of that social framework. 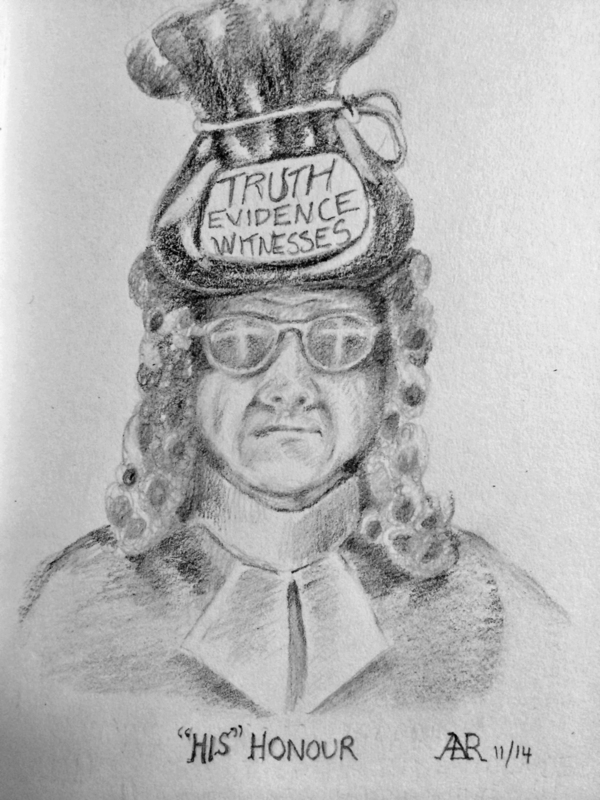 To be an atheist, an artist, a thinker in Australia is to court trouble and rejection particularly in the court system which is heavily peopled by the practicing faithful. Atheism, art critical of religion and political contradiction, art which provokes thoughts and ideas that challenge the status-quo are by their mere mention controversial. Australia's squeamish conservatism would have us believe that to criticise culture, policy, politic is to be subversive and “negative” if not seditious. It is considered better, more acceptable and more safe to reject the critic and then their criticism and protect authority even when logic and reason suffer. When this is most evident it is where any criticism of the Islamic religion and doctrine is shut down instantly with cries of “Islamophopia” or “racism”. Atheists long critical of Judaism, Christianity and the gods of antiquity are now automatically labelled “racist" and “Islamophobic" when Islam is critiqued. All atheism is viewed with some contempt and suspicion by the general religious majority but the Islamophobia slur has been so effective that even some self-described atheists consider other atheists critiquing Islam to be somehow phobic and suspect. Add to this the insidious creep towards official censorship within elements of our own human rights institutions supportive of oppressive blasphemy laws that utilise defamation law to further a cause that claims critical debate regarding faith systems is "defamation of religions”. It is a peculiar and malignant marriage of convenience representing the biggest self-made threat to the universality of our human rights in recent history. They propose laws that would legislate religions and doctrines deserving of special protection from harmful criticism as they are an attack on the human rights of the faithful who are defamed as a consequence of any criticism. The result if successful (several attempts have been made at the UN) would be catastrophic as it will criminalise blasphemy on a wide scale. As Dr Bunyan notes above ultimately they would succeed in shutting out all "dissent" by creating a "reality of their own making". To depict in my art real criticism of religious doctrine i.e. Islam is a transgression too far, one that goes against conservative, institutionally reinforced Australian moral sensitivities. Critical art is considered “offensive” art because Australians fear critical thinking and its consequences. We must work hard to protect our rights, many are unwilling, or too uninterested to do so. So the NEW-Moralist declares an artist “racist" in public and receive judicial sympathy and support for it. Thus an unbalanced legal system further punishes the artist for communicating truth, and, to object to what is categorically unjust and a persecution becomes further evidence of malice. The artist is labelled the “liar” and the bully is rewritten as victim. The evidence becomes what the judge says it is. Fed and endorsed by its colonial parent legislature Australian courts, the Victorian Supreme Court as a case in point, are leading the way onwards and downwards towards censorship and protection from criticism any idea particularly those held by the religious. It is an implementation by stealth of "defamation of religions" law. To critique religious doctrine is, simply put, as valid a form of social questioning as to critique a judicial system. Both are off limits in Australia. It is credulous to believe that in this country we have support for real forms of artistic expression or critical thinking under such conditions. If you are a critical thinking artist, an atheist and a free thinker in Australia then you are considered offensive and racist and you will have no supporters come to your aid to argue otherwise.